The visitation of God was manifested among His people through Miracle Night Event Tangerang that was held at WTC Matahari Serpong. The people started coming and filling up the seats. The event began at 18.50 p.m. Praise and worship was led by Ms. Frida Purba from PT. Pratama. To open the event, worship leader invited the chairman of committee of Miracle Night Tangerang, Mr.Hendarmin from PT.Argo Pantes to deliver opening speech. Then, worship leader continued lifting up a song Ku Nyanyi Haleluya. The people worshipped God with all of their hearts. Then, the event was opened with prayer by Mr. Brian from Lippo Group, continued with a song Mari Masuk Gerbangnya and Lebih dari Pemenang. Before the Word of God was preached, worship leader led the people in worship by lifting up songs Janji-Mu Seperti Fajar and Banyak Perkara. Afterwards, Rev. Jeffry Siringo-ringo preached the Word of God from Luke 5:1-10. It was said that Simon was a hard working person. He worked very hard from morning until night, but he got nothing. “We are like Peter, we work very hard every day, but we live an ordinary live. We are ordinary employees and our businesses are ordinary too. We also often question about the existence of God. It seems that we get nothing from our hard work.” he added. Simon Peter stopped casting his net and he came to God. “Often times, we think that God leaves us, but it’s actually us who forget God. How many times do we forget Him? We’ve been far away from Him for a long time, but tonight, let us come to Him and accept Him as our God and savior,” added Rev.Jeffry. As the song Dia Jamah was being lifted up, Rev. Jeffry challenged the people to receive Jesus Christ as their God and Saviour. Many of them raised up their hands and accepted Jesus as their God and Saviour. It’s a touching moment to see those people received Jesus as their personal Saviour. Afterwards, Rev.Jeffry asked those who were sick or represented the families who were sick to come forward to be prayed by counselors. Praise God for the healing miracle that happened that night. There were two sick people, one who suffered from digestive problem for 2 years and the other who suffered for gout for 3 months, were healed by God. Rev. Jeffry continued preaching the Word of God from Luke 5:8-10. When Peter saw the miracle of God, he felt that he was very sinful, but Jesus said to him, “Don’t be afraid; from now on you will fish for people.” Are we willing to be used by God as His tool? Regardless of what our past is, when the mercy of God is upon us, He is able to make us become fishers of men. Don’t be afraid. We have to know that God has plans for us. Therefore, don’t worry about our lives. Are you willing to serve God? The preaching of the Word of God then was closed by challenging the people who wanted to surrender their lives to God and serve Him. It was a beautiful sight to see those people raised up their hands and surrendered their lives to be used by God as His servants. They were prayed so that God used them and anointed them as servants of God and the plans of God be revealed to them. Finally, the event was closed with a joyful song Sbab Kau Besar and the people joyfully praised God and blessing prayer was conducted by Rev. Jeffry. 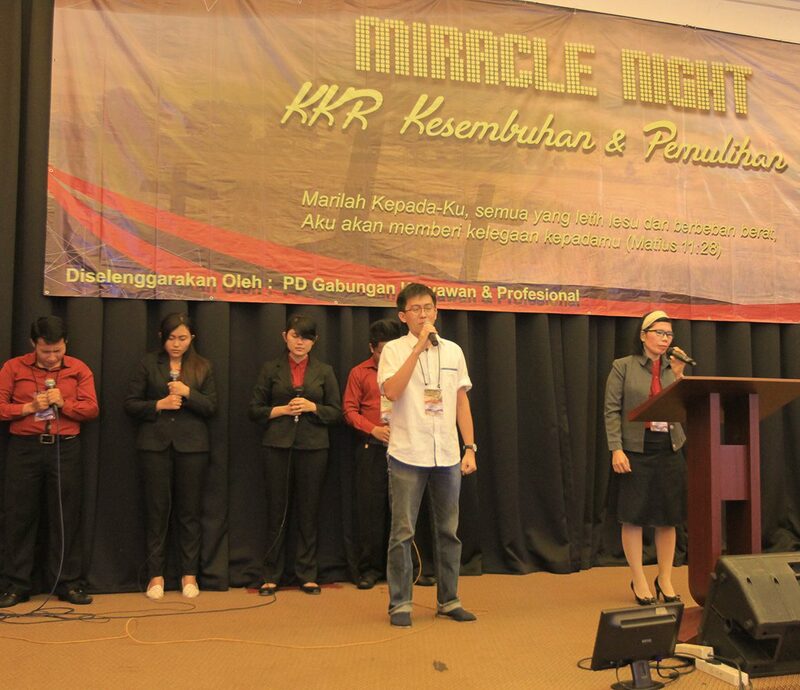 Praise the Lord for the salvation and visitation that were manifested at the Miracle Night Event in Tangerang. The number of people who attended the event was 148 people, seventy people were born again and two sick people were healed. There were thirty two people who surrendered their lives to be used as the servants of God.